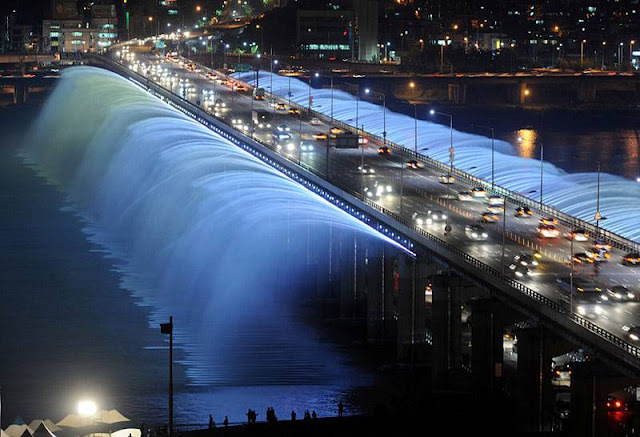 Your average citizen of Seoul would know where you were going if you asked for the Banpo Bridge. Yet, strictly speaking that name only describes the top part of the structure – the top bridge as it were. The one below it is called the Jamsu Bridge. In for a penny, the bridge’s water feature was given its own, suitably modest name – the Magic Rainbow Fountain. Once upon a time in the summer of ‘69 four chaps from Liverpool took a few short steps across Abbey Road in London. The rest is history – a moment in time and one of the most iconic photographs of The Beatles captured. Their road crossing was to be endlessly repeated by host after host of adoring fans. That famous pedestrian crossing is given its own short documentary here. 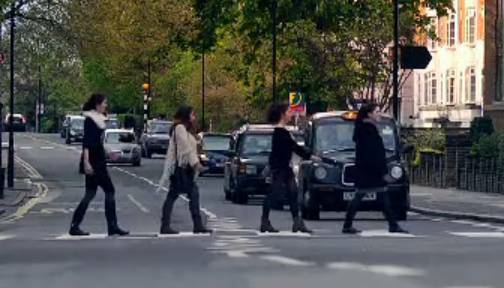 Lyrical and charming it was created to (roughly) mark the fiftieth anniversary of when the Beatles first recorded at Abbey Road studios. 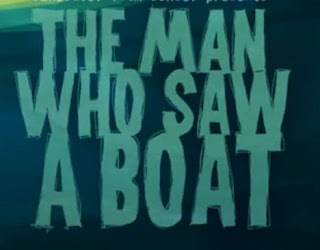 To cap it all it is narrated by one of my favorite poets of all time, Roger McGough. A lovely way to spend five minutes. 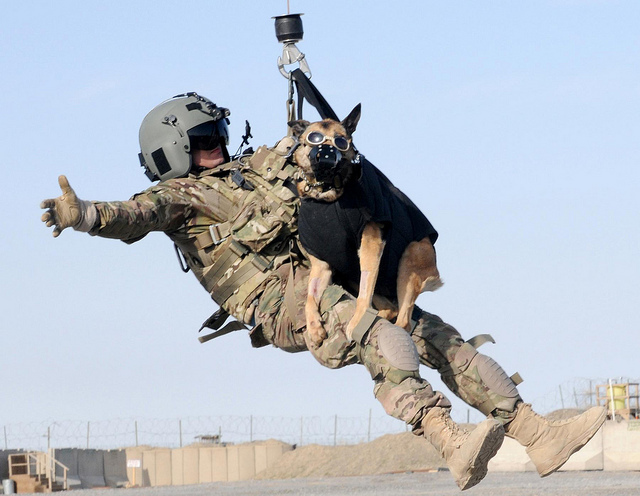 Dogs have been used in warfare for millennia – and are still trained to operate in war zones today. 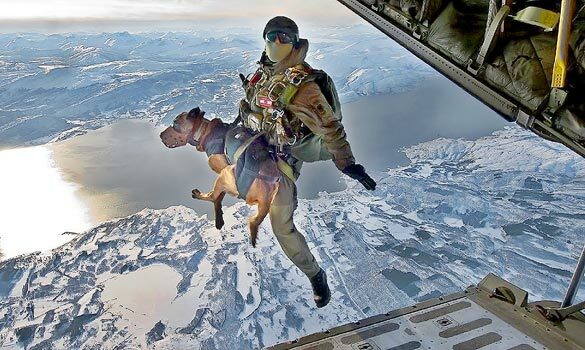 The Ark in Space today has a pictorial feature on the Military Working Dog. From the scouts to the tracker, detectors and sentries, this is a tribute to those dogs who work with the military today - and of course their trainers. A man lives at the bottom of the ocean but his peace of mind is broken by the appearance of a boat on the surface, way above his head. 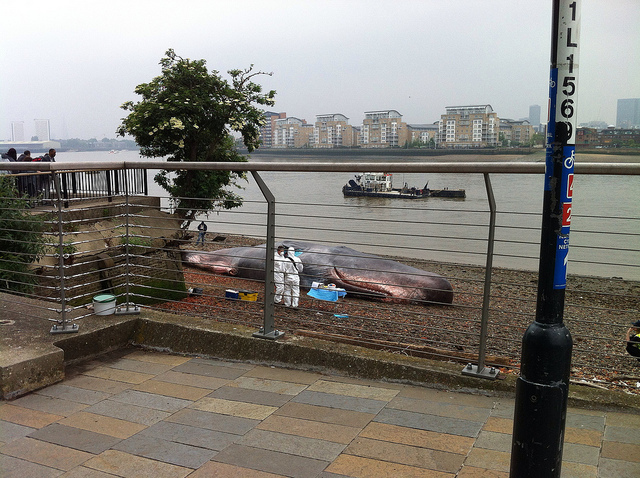 Should he go and explore or remain content where he is at the sea bed? This gorgeous looking animated short is by Henrique Baron who created it in the Digital Character Animation course at Vancouver Film School. 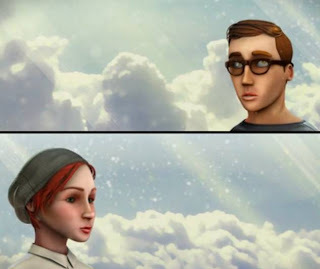 It is great to see an animation (particularly a student animation) with such an existential stance, the idea that philosophical thought begins with the human subject—not only the thinking subject, but the acting, feeling, incarnate human individual. The starting point here – the existential attitude per se is the sense of disorientation the protagonist feels in his apparently illogical world. I also loved the resolution which, despite the abstract nature of this animated short, leads the way towards another philosophical revelation. Nietzsche would have loved this. 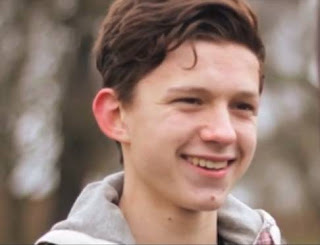 Last year seventeen year old Tom Holland won the Hollywood Spotlight Award, the National Board of Review’s award for “Breakthrough Actor”, the London Film Critics Circle Award for “Young British Performer of the Year” not to mention the Young Artist Award for “Best Leading Actor in a Feature Film”. He was, furthermore, included in Screen International’s “UK Stars of Tomorrow – 2012” and in Variety’s “Youth Impact Report 2012”. No pressure then. If his face is still not familiar to you then you may remember him starring alongside Ewan McGregor and Naomi Watts in 2012's tsunami dram The Impossible. Although he has a number of major projects coming up this year and next, including How I Live Now and Locke, it is good to see an up and coming young actor opting to support independent filmmaking by taking the plunge in to what is, more or less, a talking head. Moments is a simple but moving short film about a young man saying his last farewells to his girlfriend, and speaking of the precious times they shared together, perhaps without realising that they would come to an end all too soon. We shouldn’t forget Molly Marodeen here, who makes the very most of her role as the girlfriend in a coma. Moments was directed, filmed and produced by Lloyd Cook. Cook is a freelance filmmaker from London. He is currently studying at the BRIT School, an independent, state funded City College for the Technology of the Arts (which probably makes him still in his teens so hats off to him for such confident directing). 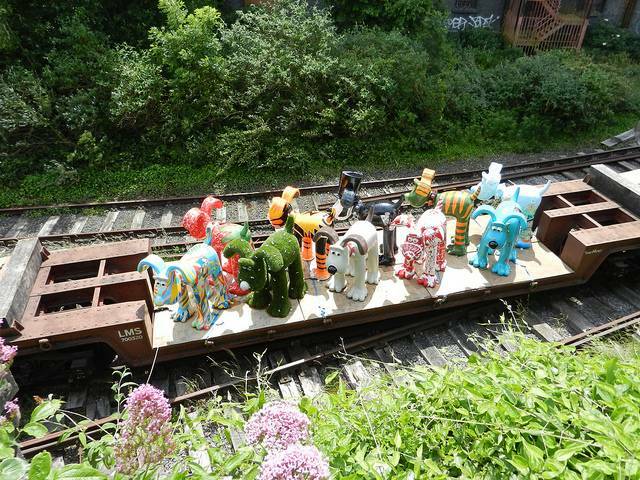 If you are a fan of Wallace and Gromit, the lovable but hapless inventor and his canine fixer, then you might want to pack your bags and head to the city of Bristol in the south west of England. 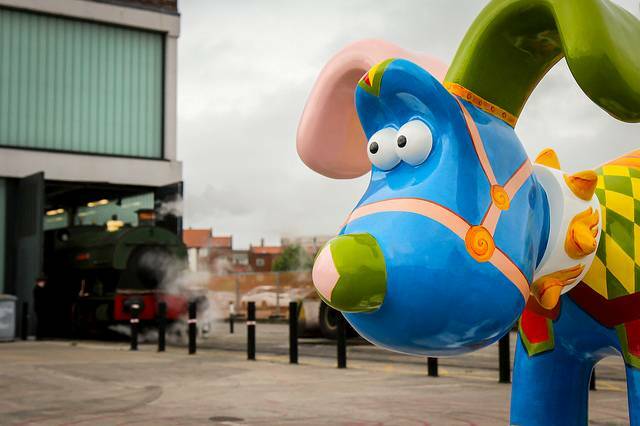 Gromit has taken flight from his northern home of Wigan and arrived in Bristol in the form of eighty amazing five foot tall sculptures. The whole experience is rather cleverly named Gromit Unleashed. This is an odd and enigmatic short movie which means it has found its natural home here at Kuriositas..! A young woman, artistic but disenfranchised, lives in a nameless East European city. Her acts of rebellion from her grey surroundings come through her street art as well as her tattoos and piercings. One day she encounters a spiteful old woman who harbors a dark secret. There is a darkness to ColourBleed which reminds me of the fairy tales of the Brother Grimm. ColourBleed was written and directed by Peter Szewczyk in association with BBC Film Network and BBC HD. This is his second outing as director but he has been involved in the visual effects of a multitude of movies, including Harry Potter and the Deathly Hallows, Dark Clouds, Avatar and The Day the Earth Stood Still to name but a few. The Future of Television: It's Magic! Technology. I think I have given up trying to understand it – I just get on and use it, almost as if it is some sort of magic! Talking of which, the Sony Smart TV is something else. There is no horribly technical set up but you can do things with it that do indeed seem like magic. For a start there is the ability to place your one-touch enabled smartphone against the remote that Sony provides with the TV. A single touch and you can see anything that is on your phone on the large TV screen. So no more squinting at videos, photos and games anymore. Another great feature is something called the TV SideView which is great if you are, like me, one of those people who want to find out more about a TV show while it is on. Sometimes I see an actor whose name I can’t place and that means diving for the PC and looking the show up, then trying to find the actor’s name, then getting their details. Often by the time I have done that, half the show is over! What the Sony Smart TV does, however, is enable you to use your smartphone or your tablet to discover more about what is on the TV in front of you. You can even tweet as you go along, keeping yourself, your family and friends in the hash tag loop! Not so long ago all this (if it had even been possible) would have meant a thousand cables and wires around your living space which would quickly come to resemble the interior of a spaceship from a 1950s science fiction show! With the Sony Smart TV there are no hassles as the Wi-Fi is built in. You can keep yourself continually connected with all your devices, from your smartphone to your Blu-ray disc player and of course, your laptop of PC. All in all, sounds like magic to me! 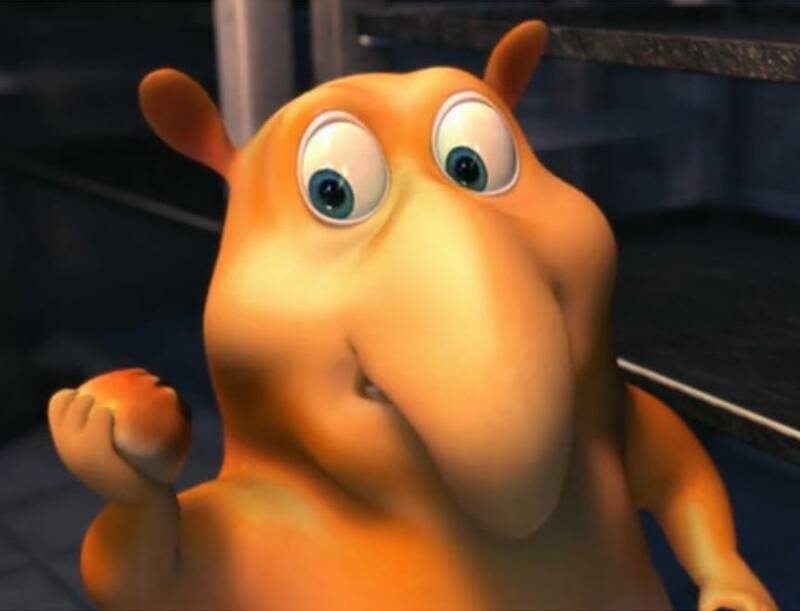 The creators of The Best Recipe could have easily called their animated short Kung Fu Tapir and they would probably have got away with it. However, that small act would have undermined their own film’s originality: it stands perfectly well on its own without any homage to feature length animations. I have to say it is the first time I have seen a tapir as the hero in an animation – but if you know of one which I have overlooked, let me know! This particular tapir is a hungry little chap and is attracted by the aroma of Siew Pao (a delicious pork filled bun) to enter the chef’s workshop. However, the chef (who is busy trying – and failing – to perfect his recipe) isn’t too happy to have a tapir on the premises and battle ensues! The Best Recipe was created by a group of students for their final project at the One Academy in Malaysia, Sia Ding Shen, Chew Kin Lek, Patrick Liow. Lim Mei Shyuan and Zhang Lu. Alfred Hitchcock maintained that cutting, in film editing terms, was something of a misnomer. In fact, he said that rather than being cut from many different pieces a finished film was in fact assembled. There is no better example of this than the infamous shower scene in Psycho where Janet Leigh is attacked by a mystery (at that point in the film) assailant. There were over seventy different pieces of film used in that short sequence, both to heighten the terror of the audience and to box clever with the censors of the day. 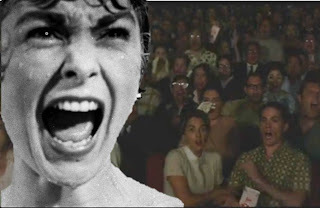 This homage to both Hitchcock and Psycho was assembled by Brian Carroll who – appropriately enough – is an editor. He brings together scenes from the movie, excerpts of interviews with the director and Janet Leigh, and combines it with and some pretty nifty editing of the Anthony Hopkins movie Hitchcock to assemble a wonderful impression of how perhaps the greatest pioneer of cinematic suspense got away with it. The Boy and the Monster was directed by Julia Zhuravleva who is (or perhaps was) a student of the All-Russian State University of Cinematography (VGIK). This is her graduation movie. Sometimes a film can take you aback, quite simply. 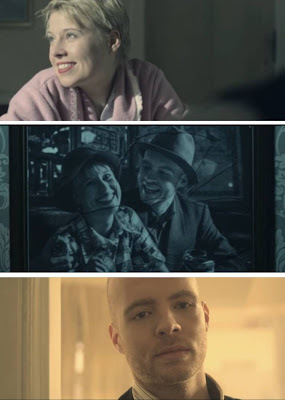 Helena is one of the cleverest and most touching short films I have ever seen. The eponymous heroine is a Flemish school teacher who lives with her husband Roger. You might think at first sight everything looks fine – they make a handsome couple – yet Roger seems almost immediately something of a controlling bully. Moreover, Helena is troubled by visions of discord which wake her from her slumber at night and seem to intrude on her waking hours too. Central is the photograph in its shattered glass frame of the day Roger proposed to her. She steadily descends in to a condition approaching paranoia. I have to say I didn’t see the denouement coming and I won’t give it away. However, I will say that you may need to have a handkerchief nearby although the film thankfully avoids any kind of schmaltz. Helena is, at its heart, a simple tale of enduring love told in a rather complicated way. It was written by Joachim Huveneers and Wesley Versteeg and also directed by the latter. It stars Catherine Kools, Karel Tuytschaever, Marilou Mermans and Frans Maas. And it's wonderful. There are surprises around every corner at this unique museum, sights which will provoke thought and sometimes even laughter. 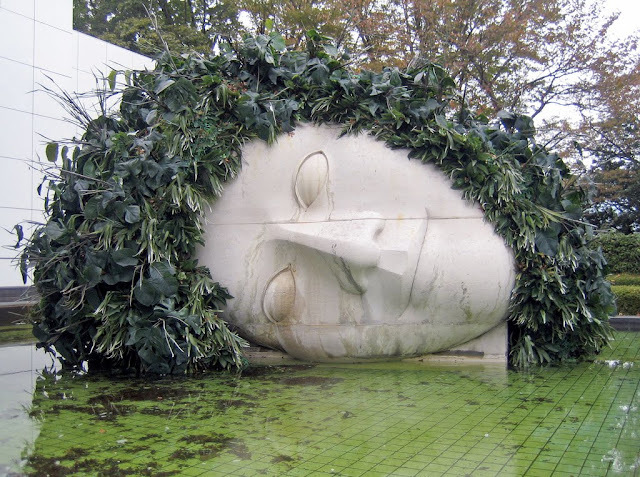 This head on its side looks like some vast relic of a long vanished civilisation. We usually try to avoid unfinished pieces on Kuriositas but I think you will agree that an exception really had to be made for this. The Leadenhall Building in London is due to be completed in the middle of 2014. It has already attracted a nickname – The Cheesegrater – and it is being constructed by the architects Rogers Stirk Harbour + Partners. 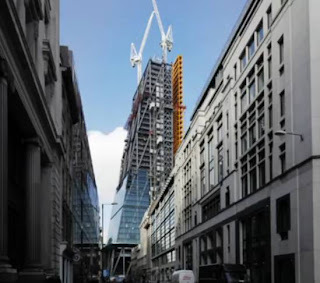 In turn, they have commissioned Paul Raftery and Dan Lowe to film the construction of The Leadenhall Building and this represents the half-way point. It is a very cool piece of film – I particularly like the tilt-shift techniques used as well as the hyperlapse along the river (but why did that get cut so short!?). When complete this will be a wonderful record of a project which is helping to transform London’s skyline for the twenty first century and beyond. When parents fall out of love it is never easy for any children born of the relationship. Often they can feel overwhelmed by what is going on around them. Their powerlessness to control the situation is something they strongly sense and they can sometimes blame themselves for what is essentially out of their control. Paradigm centers around two such children, Calvin and Lily. Calvin is the older, pragmatic one. As with any paradigm the one presented to the children is interpreted by both (as the scientists, effectively), very differently. Calvin may be the logical one but Lily at least has an idea how to fix the situation – to build a time machine and put it all right. Together, the siblings manage to rationalize what their parents are going through. This short, sweet but ever so slightly melancholy movie was written and directed by Stephen Boyer who elicits very strong performances from his young cast, Blake Hardy and Analise Schoenbaum. 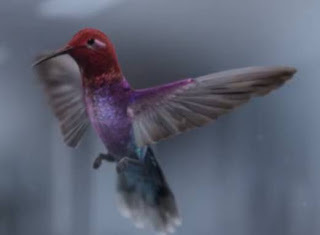 Do you ever feel sorry for those birds, busy minding their own business when they get sucked in to the turbines of an airplane? In Birdstrike the shoe is on the other foot, as it were, as the plane is suddenly smaller than the bird. Johannes Schiehsl created this terrific animated short as part of his second year at the Filmakademie Baden-Württemberg in Germany. Since graduating, Schiehsl now works as a director at Neuer Österreichischer Trickfilm in Vienna and Berlin. 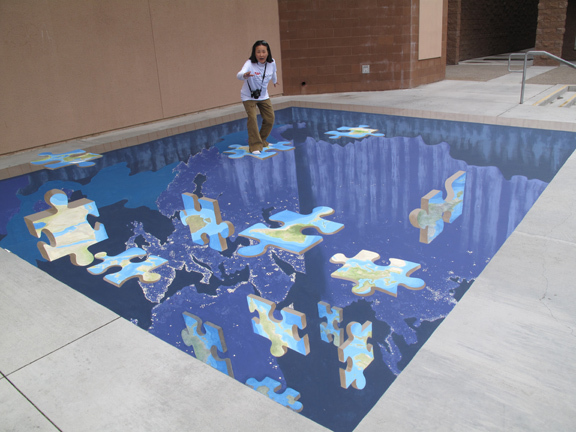 Pavement art is, by its very nature, ephemeral. Fortunately we live in the age of the camera and so the works of maddonari (as they are otherwise more formally called) can be preserved. at least digitally. Yet although we can record the images, what of the artist? Do you ever want to put a face and a story to the picture? 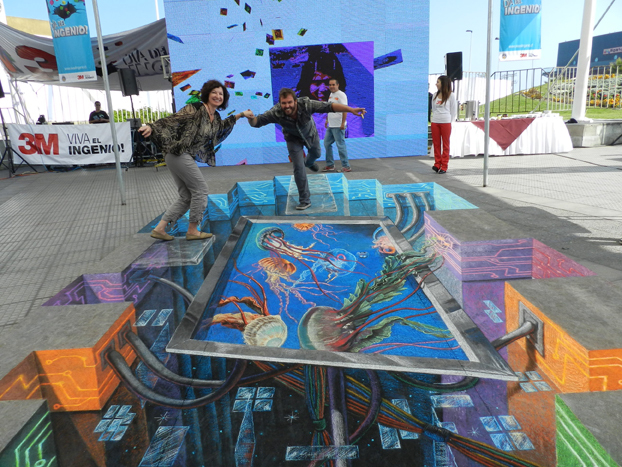 Tracy Lee Stum (left) is one of the foremost 3D street artists in the world. As you might imagine, the desire to illustrate her world followed approximately three seconds after birth. Perhaps an exaggeration but Tracy started to depict, portray and represent before she properly knew the meaning of the words, literally as soon as she could grasp chalk or crayon. Nothing can be quite so liberating as the imagination and the imagination of a child is freer than any. A little girl, alone on a park bench allows her thoughts and dreams to roam free, her fantasies setting her off on a short but exciting adventure. 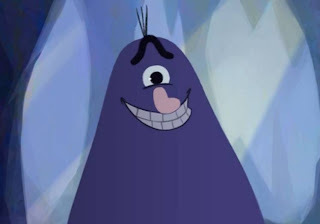 If you need a little cheering up then I can’t recommend this animated short enough. A Shadow of Blue was directed by Carlos Lascano. An Illustrator, photographer, writer, animator and director, Carlos has achieved international recognition. 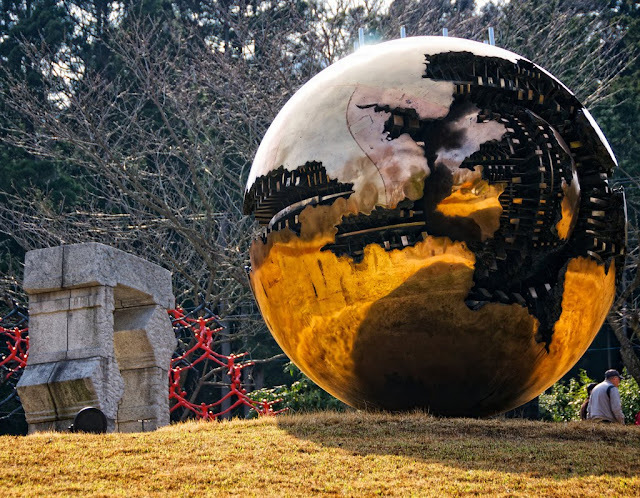 In the past few years he has developed a universe of his own, where all his different forms of expression merge together in creating a whole, personal world. Watch A Shadow of Blue – you’ll see what I mean. You won't be surprised, once you watch this, to learn that it was nominated for the Best Animated Short at the 84th Academy Awards. One Man is directed by Matt Rhodes and written by Tony Pipes. It stars Rob Jarvis who, if you have been scratching your head, you may have seen as hapless barman Eddie on the BBC show Hustle. If that’s not where you are familiar with him, then name a popular British drama from the last decade, from Waterloo Road to Law and Order UK and you will no doubt have seen his face popping up on them. 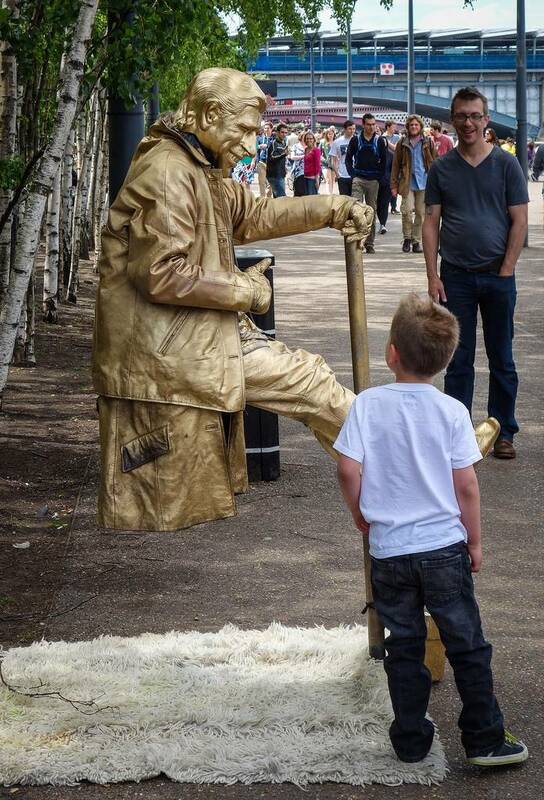 Opinion is divided on the subject of living statues. If you have traveled to any major world city then you know who I mean: the street entertainers who spend hours dressing up and applying makeup and then spend the rest of the day rooted to the spot (unless to collect money from bemused tourists or frighten small children, both of which are fine by me considering the labors they have gone through to effect their appearance). They either fascinate, creep out or both in equal parts. 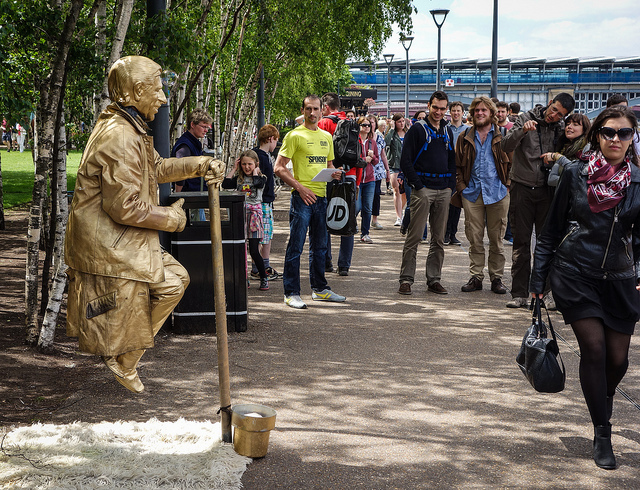 Yet this is a new one on me – the living statue apparently suspended in mid-air and looking quite relaxed about it too. So, how does he do it? These shots of a very aurelian Prince Charles were taken last week by Flickr Photographer Eugene Kaspersky. Taking possibly the only opportunity to bask in the British sunshine he will have this side of the next century, the heir to the throne apparently whisked himself away from Buckingham Palace and set himself up on his invisible throne on London’s South Bank. I am not sure if Bird and Fish is set on our planet at some point during the future (in which case it beats After Earth hands down for originality) or whether it is set elsewhere in the universe. Not that it matters. The short movie tells the story of two young souls, one bird, one fish, who inhabit the carefully delineated areas of their planet. There is very little movement or communications between the two separate zones but the inhabitants are aware of the other while remaining content to stay separate. Most blithely ignore the other society either above or below them (depending on which they come from). We are left to fill in the back-story ourselves - and I enjoy it when I am allowed to do that by filmmakers! 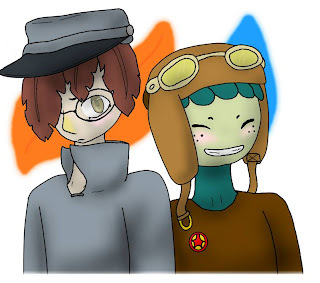 Yet things are about to change when two boys meet, one a bored and lonely delivery bird, the other a fish boy with a passion for ancient technology. Together they will change their world(s), possibly forever. 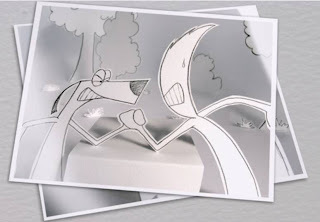 Bird and Fish is the senior graduation animation produced at the Kansas City Art Institute by Ann Mendenhall and Stephanie Son. As a by the by it’s great to see an all-female direction team at work! You can visit their production blog here. You may not be aware of this but the 10th March 1453 saw the launch of the first Viennese Space Mission and this marvelous animated short movie, The Adjustable Cosmos, tells that tale. I think I enjoyed The Adjustable Cosmos as much as anything I have seen recently at the cinema, if not more – it’s a thoroughly enjoyable twenty minutes of rewritten history that never happened. 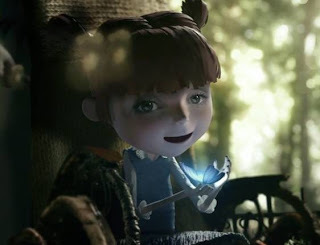 Directed by Adam Duncan it is based on a short story by Australian speculative fiction author Adam Browne. Frederick, Bessarian and Regiomontanus all existed. This makes the movie more interesting for fans of this period of history which is sadly underused in film (which has always perplexed me - it's full of fascinating things). Bessarion and Regiomontanus did meet, too, through the latter’s mentor, the astronomer and mathematician Georg von Peuerbach. In fact Regiomontanus would spend four years traveling around Northern Italy as a member of Bessarion's household. The date the three adventurers start and finish their journey is perhaps ironic – their version of world peace is brought about on 10 March 1453. Just a few weeks later, on 29 May 1453, real history saw the fall of Constantinople (modern day Istanbul) to the Ottoman Empire! Finally, I do have to admit that Regiomontanus was guilty of a little theft. He nicked quite a lot of the work of Jabir ibn Aflah, a twelfth century Seville-based Muslim astronomer and mathematician and used it in his 1464 work On Triangles. Despite this, the scientific community has long since forgiven him and the ancient lunar impact crater located in the southern highlands region to the southeast of Mare Nubium on the moon is named after him. Parabelrutsche: Is This the Coolest Slide in the World? This slide certainly begs the question above. This is the Parabelrutsche which translates as the Parabole Slide. 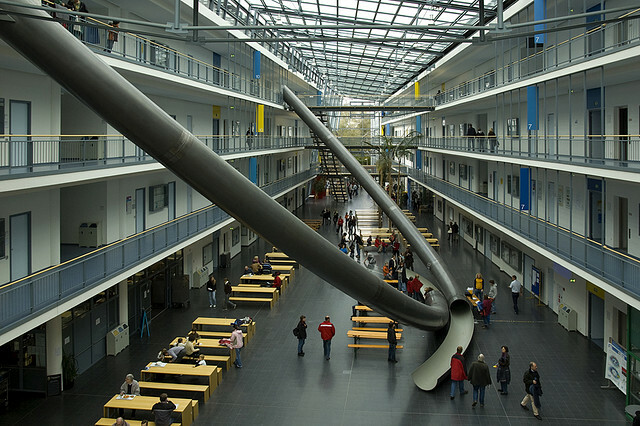 Located at the University of Technology in Munich (Technische Universität München) or TUM for short the slide enables students and other visitors to make the journey from the fourth floor a little quicker than might be expected. 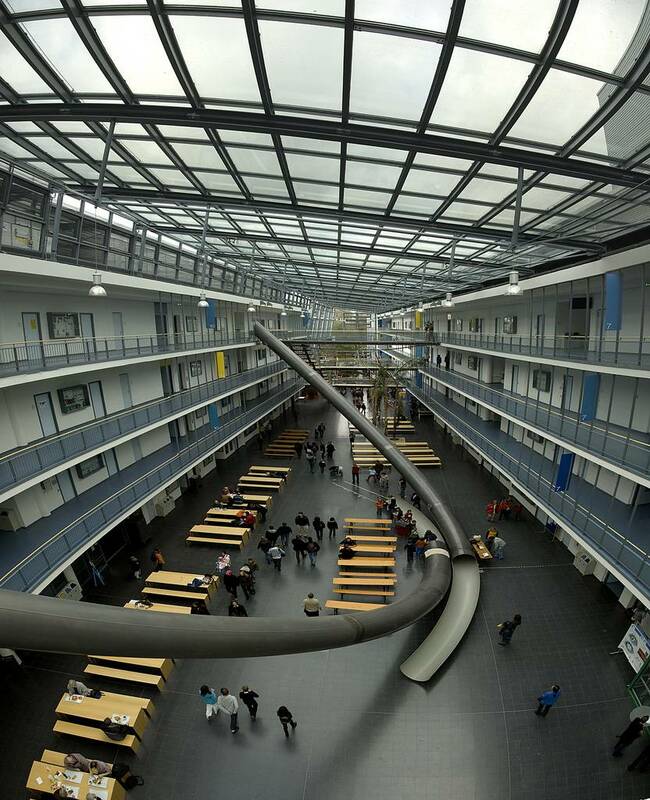 The building in which it can be found was built in 2002 to host the Faculty of Computer Science and mathematics. It does look like it was based on an open plan prison - some students jokingly call it Alcatraz. Yet the Parabola Slide makes up for the otherwise rather bleak interior. 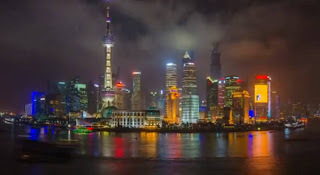 Shanghai is one of the most fascinating of world cities in terms of its history and also what it represents today. Although we may associate today’s skyline with skyscrapers the first was not built until 1980. The city juxtaposes grasping capitalism within a communist hierarchy with ultra-modern buildings towering about its citizens, many of whom still live fairly traditional existences. It is a place of contrast to say the very least. 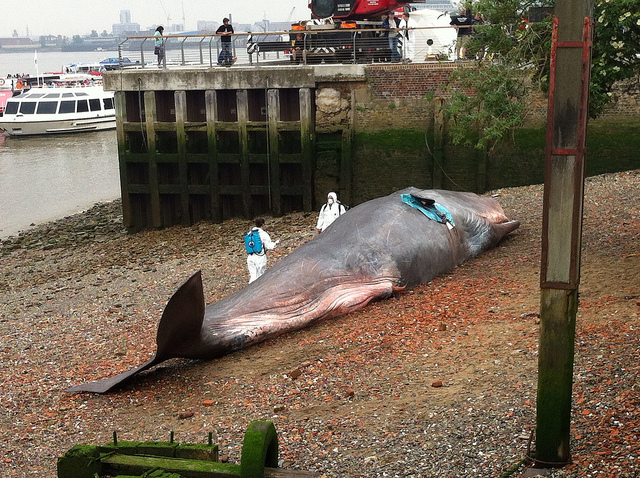 The video was created by photographer Rob Whitworth and urban identity expert JT Singh. It is Shanghai as it has never been seen before. Yet watching this you are left in no mind why some say that this is China’s century. Ahco on the Road is a collaborative effort between two artists, Soyeon Kim and Todd Hemker, whose specialties are in various animation techniques, illustration, and design and who together comprise Yellowshed. Since 2001, the two have been involved with a broad range of projects, working professionally in the world of advertising and film production as directors, art directors, designers, and animators. A lot of people have waited quite a while for this to come online and here it finally is. My Happy End tells the story of a dog who catches his own tail – and immediately becomes the best of friends with it! There is a great deal more to this animated short than that but in essence it’s a story of best friends, two sides of the same coin as it were. It went on to win many awards. The original idea, design and animation were by Milen Vitanov with technical direction by Dennis Rettowski, who completed this when they were at HFF Konrad Wolf in Babelsberg, Germany. 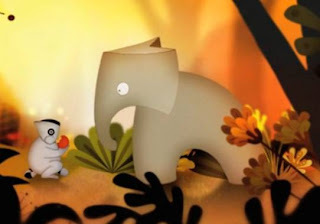 They have since gone on to form Talking Animals, a young and fresh animation studio based in Berlin. Who will replace Matt Smith? That's the question today on a lot of lips. It only seems like five minutes since David Tennant uttered the words "I don't want to go" and Doctor Who's tenth incarnation regenerated in to the eleventh, played by Smith. However, time being relative, all things must come to an end! Yes, the news broke today that Matt Smith is giving up the role of Doctor Who. The 2013 Christmas Special will see his last appearance at the helm of the Tardis. If you are a fan of Smith’s performance you probably haven’t stopped gnashing your teeth yet, but we have a question! 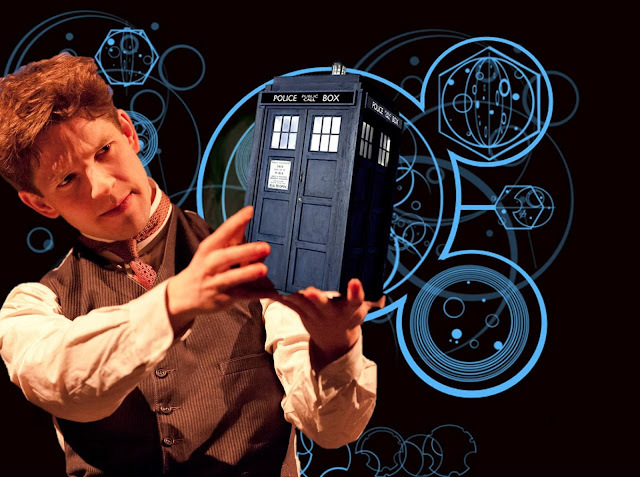 Who would you like to see replace Matt Smith as Doctor Who – and why? 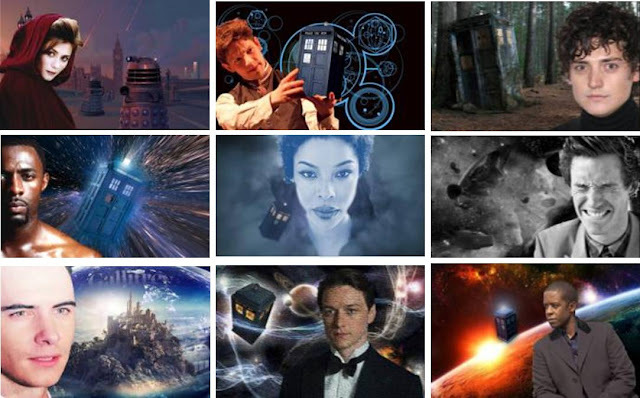 Your suggestions can be serious or silly – but have a little fun and let us know who should be the next incarnation of the wandering time lord! If you don't want to make a comment below then email at taliesyn30@aol.com. Wouldn't it be great if one of us got it right? In fact if there is a single guesser for the new Doctor, we'll send them a prize! OK, me first, me first! As Doctor Who was recently branded 'thoroughly racist' by various academics perhaps it is high time we had our first black doctor on board the Tardis? 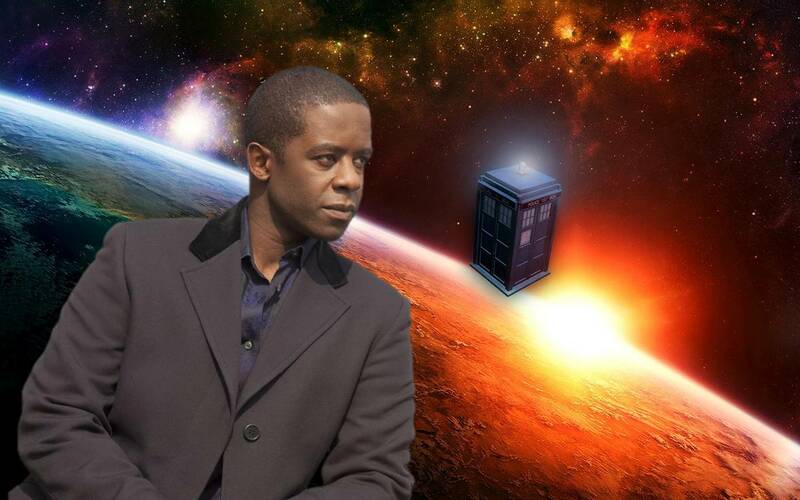 Adrian Lester would certainly make a great Doctor in my mind. As well as being a great Shakespearean actor who would bring gravitas to the role (needed if a young man is to play the part, as seems to be the fashion!) he would also make a great contrast to Matt Smith’s manic incarnation by bringing more than a little cool on board. He is perhaps best known for his appearance as gang leader Mickey in 42 episodes of the BBC TV serial Hustle but international viewers may remember him best for his small role as a doomed scientist in The Day After Tomorrow. "I will go for Damien Molony. He has already proven his acting mettle playing Hal the angst ridden vampire in the UK version of Being Human. He also has plenty of stage acting experience which is also a plus for anyone playing the Doctor. I think he is going to be in the new series of Ripper Street next year but he certainly fits in with the series’ habit of choosing relatively little known but up and coming actors for the role. Also at 29 he is about the right age to play the character (following the recent trend of youngish time lords!)". The difficult first date. Often it’s hard to know where to begin, to start to get to know that mysterious other sat opposite to you. Perhaps a common interest will draw the two together? Yet when it comes to a man and a woman often the routes that are taken can be quite different. A leap of the imagination shows us that whereas it may not always be a case of Mars and Venus the genders can have a very different take on the same planet! This charming animated short is the work of a number of students at The Animation School in South Africa – Armand Filmalter, Theresa Hargitai, Alexandre Salomon, Simon Van Der Merwe, Stephen Van Wyk and Michelle White with music by Craig Ormond.